Today’s guest on the podcast is an author, maverick spiritual teacher, master trainer and founder of Center for Transformative Change, Reverend angel Kyodo williams. She has been bridging the worlds of personal transformation and justice since the publication of her critically-acclaimed book, Being Black: Zen and the Art of Living with Fearlessness and Grace, which was hailed as “an act of love” by Pulitzer Prize winner Alice Walker and “a classic” by Buddhist teacher Jack Kornfield. 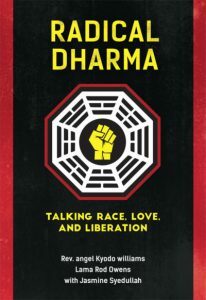 Her new book, Radical Dharma, explores racial injustice as a barrier to collective awakening. Ordained as a Zen priest, Rev. angel is a Sensei, the second black woman recognized as a teacher in her lineage. She is a social visionary that applies wisdom teachings and practice to social issues. She sees Transformative Social Change as the world’s next great movement. Both fierce and grounded, she is known for her unflinching willingness to both sit with and speak uncomfortable truths with love.